1.Tip the flour into a large mixing bowl with the cinnamon. Add the egg and milk, and whisk vigorously until you have a smooth pouring consistency. 2. Place a non-stick frying pan over a medium heat and add a little of the oil. When the oil starts to heat, wipe most of it away with kitchen paper. Once the pan is hot, pour a small amount of the batter into the centre of the pan and swirl it to the sides of the pan in a thin layer. Leave to cook, untouched, for about 2 mins. When it is brown underneath, turn over and cook for 1 min more. 3. Transfer to a warm plate and cover with foil to keep warm. Repeat with the remaining batter. 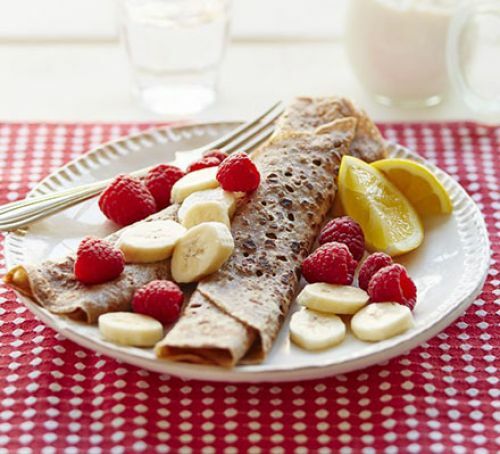 Divide the warm pancakes between 2 plates and serve with the nut butter, banana, raspberries and lemon to assemble at the table.